Nacatnagan Cliff is a 150 foot high part of a mountain. This is an Ilocano word that translates as "fell down". The Cliff consists of virgin rain forest with a great variety of trees, shrubs and bird species. Also animals can be sighted. The foot and slopes of the cliffs has a great variety of rare fern species and wild. The bird call will test all bird watchers. The cliffs are popular with mountain climbers due to its challenging steep lopes and trails. The sleepy rural coastal village of Pagudpud is located close by on the most Northern tip of Luzon, in the Philippines and is about 50 miles up the seacoast from Laoag City, the capital of Ilocos Norte province. The village is situated to the north of Bangui and its now renowned windmills and inland lies the monumental Cordillera Mountain Range, the largest mountain range in the Philippines. Just over the other side of the mountain range lies the province of Cagayan. To the North and the West are the balmy waters of the South China Sea. Many international tourists from Asia, Australia, USA and Europe are today becoming highly interested and lately one of Australia's most respected and important international travel writers graded Saud Beach as Number 1 on the list of the Top Ten best Asian Beaches. Why not uncover Pagudpud for yourself before the other tourists find out. The local vicinity comprises really stunning and almost abandoned beaches, dramatic waterfalls, sensational scenic vistas, and a real genuine get away from the rat race feeling. It is no wonder that so many movies and television commercials are filmed there. imagine a beach without too many tourists, no noisy jet skis, no strip of bars and not even a McDonalds restaurant! 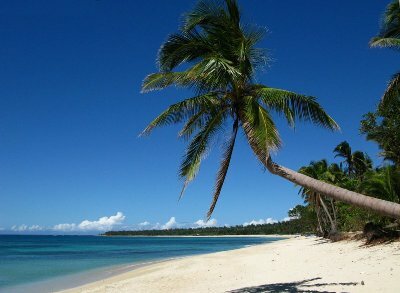 Pagudpud is located amidst leafy green mountains, rich valleys, rolling hills and flat coastal plains. The 20,000 inhabitants who stay in Pagudpud and the surrounding area subsist on rice farming, common agriculture, fishing, and the fresh fish and lobsters are luscious and low-priced here and more latterly tourism is increasing. Because Pagudpud is so uncommercialized there are limited places to stay and you need to book well ahead. Stay with us at Tartaruga's Hotel. Click on this link to find out more about Pagudpud. All About Philippines Vacations and all you need to know about Nacatnagan Cliff.